And in doing so, made itself a poster child for rethinking the insane costs of major sporting events like the Olympics, explaining that it would start over with a new design. Could the tide be turning against the idea that cities have to spend billions to host the Games? Early this morning, the Guardian reported that the Japanese government had reached a decision about the fate of its New National Stadium after two years of protests, redesigns, and cost-reductions. “We have decided to go back to the start on the Tokyo Olympics-Paralympics stadium plan, and start over from zero,” said prime minister Shinzo Abe, according to The Guardian. The new stadium will have to be designed and built in less than five years—and the World Cup of rugby, which was supposed to take place in the stadium in 2019, will have to find some other venue (the rugby execs, as you might expect, are pissed). So, how on Earth does a building that was designed three years ago, on a necessarily razor-sharp schedule, for a sporting event that will take place in a handful of years, get cancelled outright? Let’s review. The stadium was designed by high-profile UK/Iraqi architect Zaha Hadid, and was originally projected to cost around $3.1 billion—as we pointed out at the time, that’s $2.6 billion more than Hadid’s Olympic venue in London. As soon as the building was announced, the problems began. A coalition of famous Japanese architects, including Pritzker Prize winner Fumihiko Maki, Sou Fujimoto, and many others, threw an incredible amount of shade—at least for the architecture world—at the design of their colleague. A few choice insults included calling it “a disgrace,” “just ridiculous,” “a gigantic white elephant,” and “like a turtle waiting for Japan to sink so that it can swim away.” BOOYAH. But Hadid responded with her own zingers. “They don’t want a foreigner to build in Tokyo for a national stadium,” she said last December. “The fact that they lost is their problem, they lost the competition.” Critics shot back that the building was massively over-sized for the site and that it would ultimately become an albatross around the neck of a city—and country—that’s already under immense financial burden. Over the past two years, public protests drew thousands of people in Tokyo, and last summer, the Japanese government said it would reconsider the design and cut the costs by a whopping $1.3 billion. Today, it looks like that wasn’t enough. 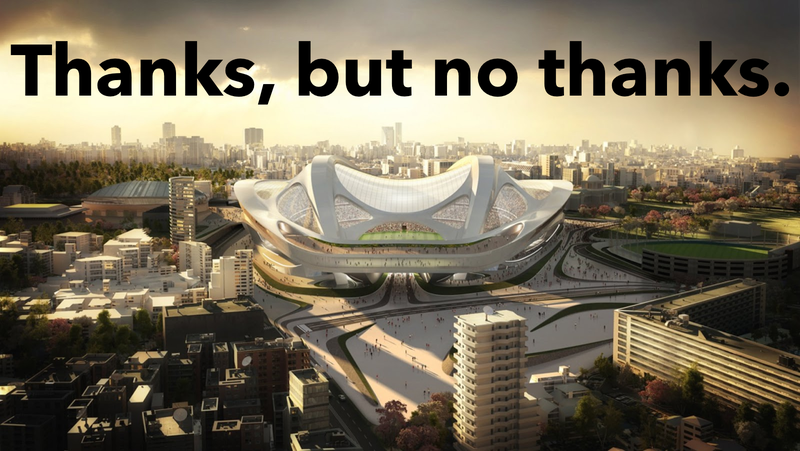 Japan says it will scrap the design completely and figure out a way to build a stadium within the next five years that can host the Olympics without costing billions and overwhelming the neighborhood. As contentious as this whole debacle has been, this is great news for more cities than Tokyo. The absurd cost of hosting the Olympics is more than just a crap deal for host cities. It’s potentially a crap deal for whole countries and even international economic zones. The Athens Olympics, in 2004, has widely been blamed for helping trigger the economic collapse in Greece that’s currently threatening the stability of the entire Eurozone. In the decade since, potential host cities have cut and run, with the International Olympic Committee struggling to find potential hosts beyond countries like Kazakhstan, Russia, and China. Here in the US, as four cities competed to be considered by the IOC for the 2024 Olympics, the competition was overshadowed by protests in each city against the Olympics entirely. Boston, which eventually won the right to compete for the Games, is itself in the midst of turmoil with citizens rallying against the honor. Japan’s choice to start from scratch might have been motivated by national sentiment, by budget issues, or by any number of other factors. And it still must build another stadium. Still, it’s still good news for other cities under immense pressure to deliver on a timeline for the IOC, which, as a matter of fact, told the Guardian that it has been “reassured that the review would not affect the delivery of the stadium in time for the Games.” While some host countries might have caved to the pressure to go through with the existing design, Japan has instead set an important precedent for the Olympics: It said no thanks.